Home / Animal Art / Doe Looking Alert! 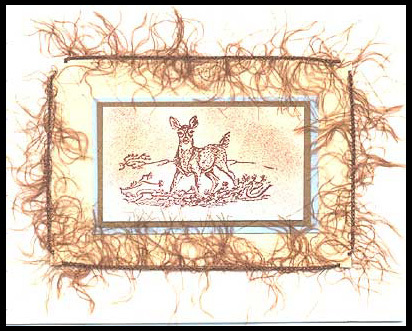 “Doe by Branches” is stamped in brown ink on white glossy card stock, sponged with light blue and brown ink, layered two times over a medium brown and a light blue card stock. This is layered onto a clay colored card stock which has the corners punched to provide a place for the fiber to attach. A few tiny pieces of the super sticky red double stick tape are used to hold the fiber down in a few spots. This is layered over white card stock. Card by Amy Vittori. Previous post: Will the Trout Take the Bait?